Canada’s sesquicentennial celebrations are just around the corner and we can’t wait to commemorate this special day! 8:00am – 6:00pm Celebrate 150 Northern Hardware Prince George Canoe Race: Competitors will race down the Nechako and Fraser Rivers in canoes to the finish line at Lheidli T’enneh Memorial Park. Cheer the paddlers on from either a bridge or riverside park, or wait for them at the finish line and join in the celebratory BBQ and live music. 10:00am – 4:00pm Dominion Day on the Homestead: Celebrate Canada’s 150th birthday the old-fashioned way with Huble Homestead. Learn how pioneers in Canada, and this region, would have marked the first of July by browsing the Parades of Patriotism display, take part in pioneer games and races, contests, a special Canadian treasure hunt, crafts, enjoy live music, indulge in birthday cake and observe heritage demonstrations. 10:00am – 4:45pm Science Alliance BBQ: Science Camp leaders are cooking burgers on the BBQ and offering burgers, drinks, and popcorn in support of Science Alliance Summer Camps for kids. Funds raised will support the awesome science camp activities and field trips that are planned for the summer. 10:00am - 3:00pm Free Admission to Waterslides at Esther's Inn: Esther's Inn is offering free admission for local children to enjoy their waterslides. Take a break from the outdoor festivities and cool down inside (children must be under 12 years old). Call 250-562-4131 for more information. 11:00am – 6:00pm Canada Day in Lheidli T’enneh Memorial Park: This is the city’s main celebration for Canada Day. Opening ceremonies begin at noon and include the serving of a 4’x8’ birthday cake. The mainstage will offer seven hours of non-stop performances, including a wide variety of culturally diverse entertainers. There will be vendors, ethnic food, crafts, and more available for the whole family to enjoy. *Scroll to the bottom of the page for a complete schedule of activities at Lheidli T’enneh Memorial Park. 11:00am – 6:00pm Spike for Kids’ Sake – Beach Volleyball Tournament: Join Big Brothers Big Sisters in Lheidli T’enneh Memorial Park for a beach volleyball tournament to support local children. Cheer on the teams as they compete to be the best volleyball team in Prince George. 1:00pm (approximate) CP140 Aircraft flies over Prince George: As part of the Canada Day celebrations, a Royal Canadian Air Force CP140 Aircraft will fly over Prince George. The 419 tactical squadron will start at the Prince George Airport and fly towards the Fraser River then travel upstream and past Lheidli T’enneh Memorial Park. *Please note the timing is approximate, you may want to arrive at the park early to ensure you don’t miss the plane. 3:00pm - late Special Canada 150 Menu at Kask: Explore Kask's $1.50 menu featuring mini cocktails, taster beers, and tacos. 7:00pm – 10:30pm Canada 150 Heatwave –The French Connection, Andino Suns, Delhi 2 Dublin: Enjoy free, live music in Canada Games Plaza as part of this free eight-day music festival presented by Coldsnap. (There will be two concerts daily in Canada Games Plaza, one during the lunch hour and one in the evening until July 8). 11:00pm Canfor Canada Day Fireworks: Fireworks will be set off from Connaught Hill. View them in Canada Games Plaza following the Heatwave concert or from downtown Prince George. Transit: All day on July 1 transit users can ride the bus for $1 or a donation of a non-perishable food item to the Salvation Army. Bus routes will run on a Sunday schedule, with extended service on Route 46 until 4:30pm. Routes 15, 88, and 89 will have extended late-night service ending at midnight. National Aboriginal Day is Wednesday, June 21. Join us in Lheidli T'enneh Memorial Park as we celebrate the culture of the First Nations and Metis people. On June 21 you can also mark the opening of a new permanent Lheidli T'enneh exhibit in The Exploration Place, a museum also located in Lheidli T'enneh Memorial Park. See the image below for a complete stage schedule. 1. Visit the 43rd Annual Show n’ Shine in Lheidli T’enneh Memorial Park from 10am – 4pm. This signature features hundreds of vehicles of all kinds, including classics, hot rods, motorcycles, exotic cars, and even occasional big trucks. This is the largest collection of exhibition-grade vehicles in Prince George. Last year’s event had the largest display ever, with 389 vehicles showcased on the lawn. There will also be music, vendors, demonstrations, information booths, and more. Fore Bistro & Patio is having a special brunch featuring a delicious menu, including fresh smoked brisket, maple smoked bacon, crepes with flambéed fruit, beef ribs, Cajun chicken and more! Seating times are 10am and 11:30am. There will also be a putting challenge and every Hole In One or child will win a prize. Visit Northern Lights Estate Winery for a Father’s Day picnic! They are offering complimentary wine tasting for Dad and lawn games. Frozen Paddle Ice Cream and Picnic Packages are available for purchase (or bring your own food and enjoy their wine). 3. Go fishing: Visit your favourite fishing spot together, or borrow our rods and tackle and visit a new place. Make a splash when you give him a gift by signing him up for a fly-fishing experience with Northern Outback Adventures. They offer everything from a heli-fishing adventure, to a day of trout fishing in the Prince George area (lunch included), or a casting lesson on either a single hand or spey casting on a double hand rod. Call 250-640-7699 for more information. On May 25th, 2017, Tourism Prince George and the Community Arts Council invited artists to attend an information and feedback session about the Visitor Centre giftshop and Artnership. An introduction to the marketing material that travellers see and the expectations they have about British Columbia. An orientation to the market segments that come to the Visitor Information Centre (about %5 of BC travellers). Suggestions about the types of artwork and souvenirs that visitors are looking for and gaps in the current supply. A description of Artnership opportunities at the VIC and mobile visitor centre. If you missed the presentation, please have a look at the slides and direct any questions to Michael Stanyer, Program Manager for Visitor Services. Tourism Prince George Society operates as the destination marketing/management organization within the city of Prince George. Our team works closely with our local tourism partners to develop innovative campaigns that will drive visitation to Prince George. Reporting to the Chief Executive Officer, this strategic position is directly responsible for coordinating the sport tourism initiatives for Tourism Prince George and ensuring Prince George successfully attracts and hosts sport events and meetings which are consistent with the goals of the Sport Tourism Strategy. Please email your resume and cover letter to Tourism Prince George at admin@tourismpg.com by Friday, June 2nd, 2017 at 4:30 pm. We thank all candidates in advance for their interest; however only those short listed will be contacted for an interview. Camping season is nearly upon us and we are eager to spend days and nights outside with family and friends in the wilderness that surrounds Prince George. Below are five camping tips that we encourage all travellers to keep in mind. Read to the end to learn about three of our favourite campfire foods! 1. Plan ahead: We strongly recommend making campsite reservations whenever you'll be arriving at a new campground on a weekend. Most locals take advantage of the weekend and set up camp Friday afternoon and come home Sunday afternoon. If you're travelling during the weekend, call ahead or visit Discover Camping to make reservations at Provincial Parks. If you can't make reservations, try to arrive at your campground of choice in the early afternoon on a weekend to better your chances of getting a spot. 2. Check DriveBC.ca: DriveBC.ca is a website maintained by the Department of Transportation and Infrastructure. Their interactive web map will tell you about accidents, road closures, road conditions (especially important for winter travel) and construction. Even if delays are unavoidable, it's best to be aware of them. 3. Prepare for weather: Summer days in the Prince George area average around 22°C (72°F), but evening and morning can be quite cool. Pack an extra sweatshirt or jacket for those early morning walks or evenings around the campfire. 4. Set up camp: Set up your camp with your tent/trailer a safe distance away from where your fire will be. BC Parks recommends a minimum of 15 feet (4.5m) between the fire and any tent walls, hanging branches or surrounding bush. If you are tenting, make sure you store any food or fragrant items (toothpaste, deodorant, etc) in your vehicle, a bear cache, or bear hang. 5. Pack delicious food: For a leisurely camping trip, meals around the campfire can be the highlight of the day. We have three things we love cooking over the fire: bacon, bannock, and tinfoil dinner. Gather your friends or family around the campfire in the morning, and cook bacon in a cast iron pan. As it finishes, drain excess grease, put it on a plate, and pass it around the fire. It may take a while, but it is an incredible way to wake up and spend the morning outside. Bannock is a basic dough that can be baked, fried, or roasted over the fire. We prefer our recipe to include flour, baking powder, milk and vegetable oil. Bannock can be prepared a few days in advance and refrigerated until you need it. To cook, wrap it around a thick stick and roast over the fire, hot dog-style. You’ll know it’s done when the outside is golden brown and you can easily pull it off the stick. We recommend slathering the inside with butter and cinnamon sugar, jam, or hotdog fixings (with a cooked hotdog put inside). If you don’t feel like making bannock from scratch, you can buy pre-made biscuit or bread dough. Tinfoil dinner is the casserole of campfire cooking. Each person takes diced potatoes, ground beef, frozen or raw vegetables, seasonings and type of sauce or liquid (ketchup, worcestershire sauce, or beef broth) and mixes it all together into a sheet of tinfoil. Carefully fold the tinfoil into a roll and add a second layer of tinfoil to prevent burning. We recommend putting in more liquid then you think you need so that your food steams and doesn’t burn. Put the tinfoil packages near the coals of the fire to let it cook. After 10 minutes or so, carefully flip your package over using sticks or long tongs (be careful not to puncture the tinfoil), and let it cook for another 10ish minutes. If you have any other questions about camping in northern British Columbia, feel free to contact the Prince George Visitor Centre (250-562-3700 or email info@tourismpg.com). Or visit the BC Parks website to learn more about all of BC's provincial parks: http://www.env.gov.bc.ca/bcparks/. Many people tell us that their favourite thing about living in Prince George is the easy and fast access to parks, trails, and outdoor recreation activities. To help people explore more of the parks in the Prince George area, we thought we would highlight three regional parks. Kristian Winther Regional Park This 70 acre park is located on the southern shores of Salmon River (30km north of PG). Travel through a portion of the park on a 700m loop trail. Bring food for a picnic or marshmallows to roast over the fire. The park has a 2 acre lawn that is great for kicking a soccer ball around or playing catch. There are picnic tables, fire pits and toilets to make your stay enjoyable. McMillan Creek Regional Park Located off Hofferkamp Road within city limits, this park provides visitors with a scenic view of Prince George from the cutbanks. To reach the viewpoint from the parking lot walk either along the direct 1km trail or take the scenic 2.5km trail weaving through a variety of plant species. This is a great place to take out-of-town guests to give them an over-view of the city. This park has interpretive signs, picnic tables and toilets. Wilkins Regional Park Drive along Otway Road for a while and you will reach Wilkins Park on the shores of the Nechako River. This 57 hectare park has a handful of trails that weave between cottonwood trees and beside the river. This park has a stretch of lawn beside the river and a boat launch. Other facilities include a picnic shelter, wood stove, toilets, picnic tables, and firepits. To learn more about parks in the Regional District of Fraser-Fort George, visit their website at rdffg.bc.ca/services/environment/regional-parks. Leave Prince George and head west on Highway 16 for an hour before reaching Vanderhoof, the geographical center of the province of BC. Vanderhoof is also home to Nechako River Migratory Bird Sanctuary, which attracts very large numbers of spring-migrating Canada Geese. While in town, visit the Vanderhoof Museum http://www.vanderhoofmuseum.com/, then grab a quick bite to eat at Ok Café (only open seasonally). Continue on to Fort St. James (turn north on Highway 27) and take in the Fort St. James National Historic Site of Canada. http://www.pc.gc.ca/eng/lhn-nhs/bc/stjames/index.aspx. Travel back in time to 1896 when wealth was measured in fur pelts and salmon. Tour Canada’s largest collection of wooden buildings that have been restored to reflect the fur trade era. You can spend the night in the historic Murray house warmed by a wood stove and live like the traders did more than a century ago. There are often events taking place at the Historic Site, and if you’re lucky enough you might get to watch some world famous chicken racing! If you’re feeling adventurous, hike Mount Pope, a 6.5 km hiking trail to the peak provides a panoramic view of Stuart Lake and the mountains to the north. Have lunch at the café on site at the Fort overlooking Stuart Lake before returning to Prince George (1:45). Heading north on Hwy 97, stop at Huble Homestead Historic Site (40km north of Prince George) http://www.hublehomestead.ca/. Enjoy lunch after touring the historic buildings, First Nations fish camp and purchasing unique gifts in the historic General Store. Continue on Highway 97 north until you reach the Mackenzie junction and turn left on Highway 39. Located on the south end of Williston Lake (largest man-made lake in BC, and 7th largest reservoir in the world), Mackenzie is home to the world’s largest tree crusher. The Mackenzie Museum http://www.mackenziemuseum.ca/ has rich cultural, social, and natural history component that show how the development of Mackenzie in the 1960s happened as an ‘Instant Town’ in the Canadian wilderness. If you have the chance to explore Morfee Lake, there are two great beaches, one with a boat launch for motorized use and one for swimming. On route, visit Cottonwood House Historic Site, a store, museum and heritage property located on the right bank of the Cottonwood River, which was formerly the "capital" of the Cariboo Gold Rush route. Continue to Barkerville Historic Town http://www.barkerville.ca/, established in the 1860’s by Billy Barker as a gold mining settlement. Wander through the restored buildings, general store, church, Chee Kung Tong Building, which was designated a National Historic Sites of Canada in 2008. Have lunch at one of several restaurants in Barkerville and spend the night in the King House, Kelly House or St George’s Hotel. The next morning, stop at the Wells Museum, check out some local galleries and shops and take a lunch break at one of the many restaurant options on your way back to Prince George. (Approximately 2hrs). Driving on Highway 16 east, stop at Purden Lake Provincial Park, where you have the option of spending the night at a campsite, go for a swim, fish, or have a picnic. 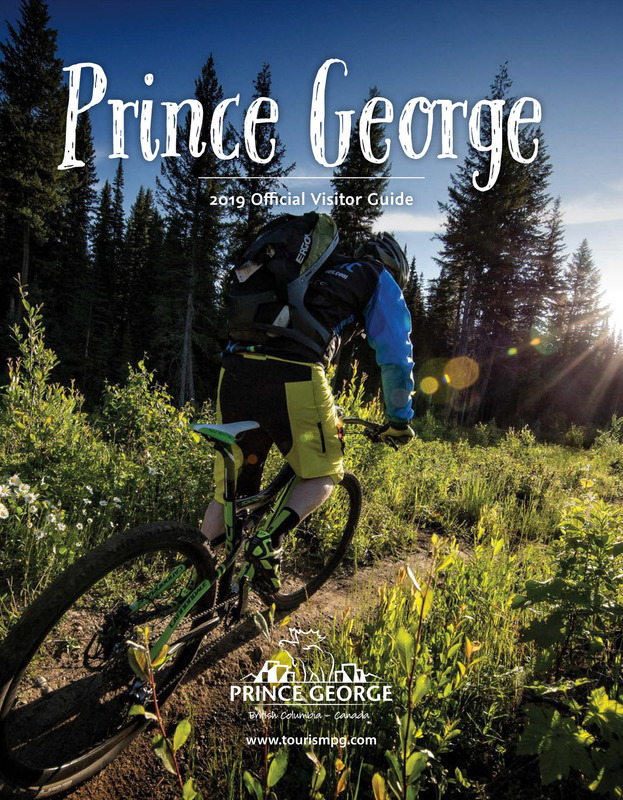 There are various difficulties of hiking trails dotted along Highway 16 east, pick up a hiking guide at the Prince George Visitor Centre before you leave town. A must see is the Ancient Forest (113km east of Prince George) Provincial Park, which is fully accessible and an easy walk along boardwalks through 2ooo year old giants. Stop at the McBride Train Station and the Whistle Stop (Consignment Art) Gallery http://www.whistlestopgallery.org/ which showcases the work of 96 Robson Valley artists and artisans. Grab a coffee and snack at the Beanery Café before checking out the McBride Valley Museum (by donation) http://www.valleymuseum.ca/index.html to learn about local history and view regional artworks. About 35km east of McBride, take a small detour to the community of Dunster, nestled in the Robson Valley and famous for it’s annual ice cream social. Continue on through to Tete Jaune Lodge, a Hudson’s Bay Log Cabin right on the Fraser River, and if you’re feeling adventurous book a white water rafting excursion. See the salmon spawn in season in the river (usually late August), before making a detour to Mount Robson, the highest peak in the Canadian Rocky Mountains to hike the famous Berg Lake Trail. Make your way to Valemount, located at the northern reach of the Rocky Mountain Trench in BC’sThompson-Okanagan Region, just 120 km (75 mi) from the entrance of Jasper National Park, and 322 km (200 mi) north of Kamloops. Visit the Valemount Museum http://valemountmuseum.ca/, which offers exhibits throughout its three floors including the recently added Ishbel Cochrane exhibit, featuring the Hargreaves brothers outfitting company and the Mount Robson ranch. The Museum also has a restored caboose and numerous artifacts from the Robson Valley’s early years of logging and agriculture sectors. Explore the Railroad Room, which has a model train running through the displays, artifacts and, yes, even through the bathroom. Pick up a tasty treat from the Swiss Bakery before heading over to Three Ranges brewery to kick back and relax. Starting at the Cameron Street Bridge in Prince George BC, walk along the Nechako River on River Rd towards Cottonwood Island Park (about 2.7km). The Central BC Railway & Forestry Museum http://www.pgrfm.bc.ca/ is located adjacent to Cottonwood Island Park and is home to logging machinery, tractors and heavy equipment, a beehive burner, rolling stock and a mini railway. Take a souvenir with you before continuing your walk through Cottonwood Island Park, where you can spot carved faces in the trees. The path leads you to Lheidli T’enneh Memorial Park (between 17th and 20th avenues), along the banks of the Fraser River. On a hot summer day take in the gardens, or the Rotary Spray Park. Also located in the Park is the Exploration Place and Science Museum http://www.theexplorationplace.com/. This interactive museum features local history, a dinosaur discovery exhibit, a living biome, First Nations gallery, Prince George Hall of Fame and more. As well, take a ride on the Little Prince Steam Engine, the only operational narrow gauge steam engine in Canada. Don’t forget to grab a scoop of your favourite craft made ice cream from Frozen Paddle after your train ride. We're happy that St Patty's Day is on a Friday this year, so we an truly get into the festive spirit! Thirsty Moose Pub: This event is sponsored by Cariboo Brewing and organized by NUGSS and the UNBC Men's Soccer team, so you know it's going to be a phenomenal night! DJ Jimi Smyth will be spinning some great tunes to keep the party lively. Tickets are $10 to start and will go up to $20 just before Friday, get your tickets at the UNBC Wintergarden, Thirsty Moose Pub and NUGSS office. The Westwood Pub: Green beer, specials on Guinness and Jameson, fantastic food, mega SWAG prizes, giveaways (including a Guinness beer fridge), live DJ, dancing, and all the other shenanigans you would hope for on St Patty's Day. Nancy O's: Looking for elevated Irish food with an incredible beer selection for St Patrick's Day? Look no further than Nancy O's, they'll be serving up Kilkenny Battered Fish n' Chips and Duck and Wild Boar Guinness Pot Pie, among other special features. Copper Pig BBQ House: These folks are doing something a little different by hosting a St Patrick's Day Communal Lunch. Buy a ticket, pull up a seat at their Social Table and enjoy various platters, boards, and bowls of local lamb stew, in-house cured corned beef and local beef ribs. This will also be your opportunity to taste a special casking of CrossRoad's Willamette Stout! Tickets are $18 each, buy yours fast because there are only 16 seats at the Social Table! Fore Bistro & Patio: Do you have the luck of the Irish? Head over to Fore Bistro for your chance to win a staycation valued at $500. The staycation includes one night in the Jr Suite at Prestige Treasure Cove Hotel, $50 free play for the casino, 2 tickets to a comedy show at the Treasure Cove and a $50 GC to Fore. You can also buy 50/50 tickets with proceeds going to the BCSPCA. Rick Stavely will be performing live and 2Crazi will be handing out giveaways throughout the night. $5 cover.